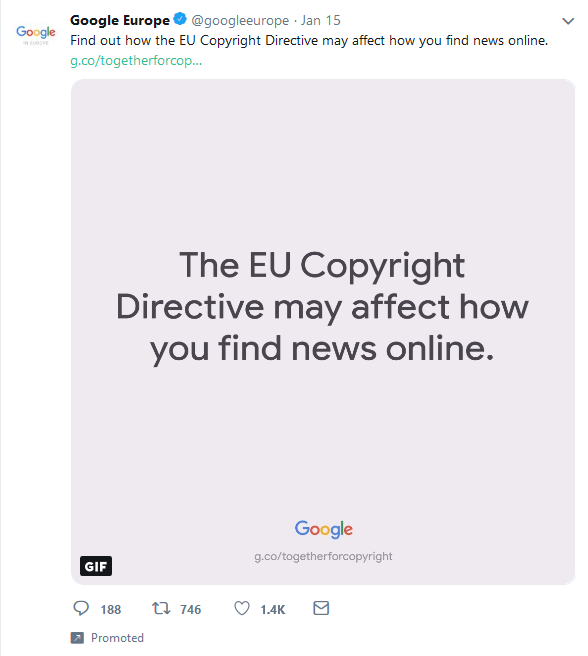 The EU has passed a new copyright law that has Google worried enough to start a campaign opposing some of the proposed legislation. Whether the UK actually exits the EU or not on the 29th March 2019, website owners and Internet users are likely to be affected by the legislation in its final form as we will continue to trade and work with EU countries whatever happens. In principle, copyright laws protect creativity. They prevent original work being copied or modified without acknowledging, paying or asking permission from the originator. The Internet has meant that it is incredibly easy to copy and steal content like photographs, images, original graphics, video and music. Protecting content producers is always the main objective so they are encouraged to keep creating. The European Union Directive on Copyright in the Digital Single Market, to give it its full name, is designed to update existing copyright laws for the internet age. The directive makes the platform providers such as You Tube, Facebook and Twitter, responsible for ensuring that material does not infringe copyright. Previously it would have been the responsibility of the uploader. At the heart of the Directive on Copyright are two controversial articles – Article 11 and Article 13 – that have been dubbed the “link tax” and “meme ban” articles respectively. Article 13 (the “meme ban”) would require the platforms to deploy content-checking technologies to check for copyright infringement when material is submitted. This is likely to lead to a lot of false positives as the technology may not be make the distinction between between material being used as a parody or meme or actually infringing copyright. In this specific case, the uploader has generally made something new and novel despite drawing heavily on copyright material. However what it will prevent is someone say, ripping off an artist’s new album and uploading it to You Tube (which is stealing). The copyright or intellectual property must be owned by whoever is uploading the material. While meme makers (who are they, really?) are up in arms, musicians are starting to come out in favour of Article 13 as it stops people ripping off copyright music, uploading the music and getting paid for someone else’s work. My name is James Blunt. I’ve been so lucky to be able to make music, but the next generation of artists coming through need to get a better deal when their music is used online. I believe we need a world where the effort and creativity that goes into making music is rewarded fairly. That’s why the proposals in Europe to ensure online services get licenses for the music they use is so important to performers and songwriters who are trying to make a living and build a career in music. “We need this problem fixed. Creators need the support of members of the European Parliament and we desperately hope you’ll give it to us. James Blunt from IFPI on Vimeo. As it owns You Tube and Google News, Google is actively advertising trying to influence the legislation. Their main argument is that Article 11 would harm smaller news publishers. Right now, Google is open to all content from publishers big and small. This helps you to uncover diverse perspectives and topics of interest from more than 80,000 publishers. The European Parliament’s proposed version of the legislation would require search services to put licenses in place that may force them to start choosing which content to include and which to exclude. If the legislation passes a vote on 18th January 2019, there will be a final negotiation between the European Parliament and Council on January 21st, and then a final vote sometime in March. After that, EU nations will have to start implementing the Copyright Directive into national law in 2021.